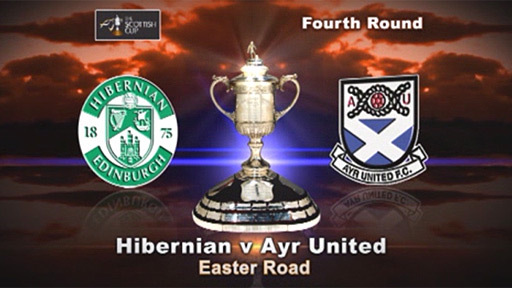 Second Division Ayr United kept Hibernian at bay at Easter Road in a goalless Scottish Cup fourth round tie. Colin Calderwood's Hibs side were poor in the first half but after the break striker Derek Riordan deflected a Liam Miller shot on to the bar. As a disappointing game petered out, David Crawford was at full stretch to save from Riordan from 12 yards. And in the final seconds only a great save by Mark Brown from Andy Rodgers earned Hibs a replay at Somerset Park. Hibs have been waiting for more than a century for Scottish Cup success and, although Calderwood is in the very early days of his Easter Road tenure, defeat to lower league opposition was unthinkable for the former Scotland defender. But it was evident from the early exchanges that Brian Reid's Ayr side, backed by 1,500 of their fans, were in the capital to give the Leith side a stern test. They had the first chance of the match when Ryan McCann's volley skipped across the face of Brown's goal and past his right-hand post. And an early tackle by Eddie Malone on the advancing Francis Dickoh, which sent the Hibs man somersaulting over the the ball, was just the sort of challenge to rally the Ayrshiremen. Midfielders Liam Miller and Merouane Zemmama tried to get on the ball to create a chance for the home side, but Hibs did not have a shot on goal by the time Ayr carved their second opportunity. A simple pass by Mark Roberts set up Scott McLaughlin 20 yards out but he snatched at his shot and screwed it wide. Riordan, partnered by Darryl Duffy up front, looked the Hibs player most likely to get on the scoresheet. Towards the end of the first half he peeled off to the left and took a pass from Danny Galbraith but uncharacteristically hoofed his shot high into the stand. Moments later he raced towards the penalty spot to collect a long through ball from Zemmama but was fractionally short of connecting with the Moroccan's incisive pass. After the break Zemmama's effort from the right side of the box was quickly followed by a volley from six yards out by Miller but it crashed off the legs of the advancing Ayr keeper. But after that save the United number one almost gifted Hibs a goal when his attempt at a volley to clear a Zemmama low cross went horribly wrong. Crawford missed the ball completely but fortunately for the Honest Men his centre-half cleared the danger. The season for giving gifts may have passed but Thicot seemed keen to extend it when he opted to pass the ball back to Brown from the corner of the pitch. McCann collected and, with only the keeper to beat, he knocked the ball hopelessly wide with the Hibs goalie out to narrow the angle. Ayr number eight McLaughlin curled a left-footed free-kick a foot or so over Brown's bar as the visitors cranked up the pressure. Calderwood made a double substitution with 16 minutes to go, sending Valdas Trakys and David Wotherspoon on for Duffy and Zemmama. Seconds later Miller thundered a right-foot volley at goal from the edge of the box and it was knocked on to the crossbar by a disbelieving Riordan. The Hibs striker almost put his team through at the end of the 90 minutes when he collected the ball over his right shoulder and struck a shot to his left - an effort that was matched by the fully stretched Crawford. The home side came within inches of going out the Scottish Cup in almost the last move of the match. Sub Rodgers worked his way into the box and curled a powerful right-foot shot to the far post but Brown pulled off a great save to keep the tie alive. At the final whistle, it was Reid and the travelling fans who celebrated. 93:23 The final whistle is blown by the referee. 90:00+3:15 Corner taken short by Scott McLaughlin. 90:00+3:00 Andy Rodgers takes a shot. Save made by Mark Brown. 90:00+0:55 A cross is delivered by Paul Hanlon, Chris Smith manages to make a clearance. 89:23 Inswinging corner taken by Derek Riordan from the left by-line, Headed effort from inside the area by Francis Dickoh misses to the right of the target. 89:23 Booking Ross Robertson goes into the referee's book. 88:25 Free kick awarded for a foul by Paul Hanlon on Alan Trouten. Direct free kick taken by Scott McLaughlin. 83:50 Unfair challenge on Derek Riordan by Ryan McCann results in a free kick. Francis Dickoh takes the free kick. 83:50 Substitution Ryan McCann goes off and Ross Robertson comes on. 81:41 Substitution Andy Rodgers replaces Mark Roberts. 80:13 Short corner taken by Derek Riordan from the left by-line. 79:22 Martyn Campbell gives away a free kick for an unfair challenge on Valdas Trakys. Derek Riordan fires a strike on goal direct from the free kick, save made by David Crawford. 78:59 Unfair challenge on Valdas Trakys by Scott McLaughlin results in a free kick. Kevin McBride takes the free kick. 78:04 Effort on goal by David Wotherspoon from just inside the penalty area goes harmlessly over the target. 77:10 Derek Riordan gives away a free kick for an unfair challenge on Martyn Campbell. David Crawford takes the free kick. 76:13 Substitution Alastair Woodburn is brought on as a substitute for William Easton. 76:00 Effort from the edge of the area by Daniel Galbraith goes wide of the right-hand upright. 75:18 Steven Thicot delivers the ball, Martyn Campbell makes a clearance. Liam Miller takes a shot. 74:12 Substitution Valdas Trakys comes on in place of Darryl Duffy. 74:12 Substitution David Wotherspoon comes on in place of Merouane Zemmama. 73:09 The ball is sent over by Paul Hanlon. 72:09 Free kick awarded for a foul by Paul Hanlon on Jonathan Tiffoney. David Crawford restarts play with the free kick. 70:03 Scott McLaughlin takes the inswinging corner, Steven Thicot manages to make a clearance. 67:20 Jonathan Grounds gives away a free kick for an unfair challenge on Mark Roberts. Scott McLaughlin produces a strike on goal direct from the free kick. 65:29 Steven Thicot crosses the ball. 64:17 Merouane Zemmama delivers the ball, Martyn Campbell manages to make a clearance. 60:43 Unfair challenge on William Easton by Kevin McBride results in a free kick. Free kick taken by Chris Smith. 60:43 Booking Kevin McBride receives a caution. 58:49 Corner taken right-footed by Derek Riordan, save by David Crawford. 55:38 Merouane Zemmama produces a curled left-footed shot from deep inside the area which goes wide of the left-hand post. 54:55 Free kick awarded for a foul by Kevin McBride on Scott McLaughlin. Ebbie Malone restarts play with the free kick. 53:54 Centre by Ryan McCann, clearance by Paul Hanlon. 53:15 Jonathan Tiffoney delivers the ball, clearance by Paul Hanlon. 51:22 Darryl Duffy takes a shot. David Crawford makes a save. 51:06 Merouane Zemmama delivers the ball, clearance by Ebbie Malone. 49:19 Inswinging corner taken right-footed by Ryan McCann from the left by-line, clearance made by Paul Hanlon. 48:44 Free kick awarded for a foul by Merouane Zemmama on Ryan McCann. Scott McLaughlin takes the free kick. 46:01 Substitution Ian Murray leaves the field to be replaced by Kevin McBride. 45:00+0:14 The whistle is blown to end the first half. 44:19 Foul by Chris Smith on Merouane Zemmama, free kick awarded. Merouane Zemmama crosses the ball from the free kick right-footed from right channel, clearance made by Jonathan Tiffoney. 40:40 Shot from inside the area by Derek Riordan clears the bar. 38:57 The ball is sent over by Jonathan Grounds. 37:35 The referee blows for offside against Derek Riordan. David Crawford takes the free kick. 36:27 Daniel Galbraith fouled by Jonathan Tiffoney, the ref awards a free kick. Direct free kick taken by Jonathan Grounds. 35:34 Free kick awarded for a foul by Francis Dickoh on Mark Roberts. Scott McLaughlin restarts play with the free kick. 30:16 Liam Miller concedes a free kick for a foul on Stuart Bannigan. Stuart Bannigan restarts play with the free kick. 27:30 Scott McLaughlin produces a left-footed shot from the edge of the box and misses to the right of the target. 26:54 Liam Miller challenges Stuart Bannigan unfairly and gives away a free kick. Scott McLaughlin takes the free kick. 26:02 Inswinging corner taken left-footed by Scott McLaughlin, clearance by Francis Dickoh. 25:54 Centre by Chris Smith, clearance by Jonathan Grounds. 25:12 Free kick awarded for an unfair challenge on William Easton by Liam Miller. Chris Smith takes the free kick. 18:51 Foul by Steven Thicot on William Easton, free kick awarded. Scott McLaughlin restarts play with the free kick. 18:23 The official flags Derek Riordan offside. Free kick taken by David Crawford. 16:17 Foul by Daniel Galbraith on Jonathan Tiffoney, free kick awarded. David Crawford takes the free kick. 12:23 The ball is delivered by Merouane Zemmama, clearance made by Ebbie Malone. 5:59 Ryan McCann has an effort at goal from deep inside the area missing to the left of the target. 5:52 A cross is delivered by Chris Smith. 4:32 Free kick awarded for a foul by Paul Hanlon on Mark Roberts. Free kick taken by Ryan McCann. 3:59 Alan Trouten fouled by Ian Murray, the ref awards a free kick. Direct free kick taken by David Crawford. 3:04 Free kick awarded for a foul by Jonathan Tiffoney on Daniel Galbraith. Direct free kick taken by Derek Riordan. 1:12 Corner taken right-footed by Derek Riordan from the left by-line to the near post, clearance by Mark Roberts. 0:28 Daniel Galbraith delivers the ball.